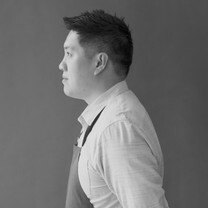 Geoffrey Lee is the chef/co-owner of Jū-Ni. As a native to San Francisco, his career path started as a college summer odd job. With nearly 15 years of hard work, resiliency, and a dedication to learning and growing to understand the flavors and culture of Sushi, he is seeing his work paid off at his award winning restaurant. "This dish is one of the most interesting takes on tempura that I have ever experienced. Rather than cooking each piece individually, they julienne the ingredients and incorporate them into a fritter-like tempura. 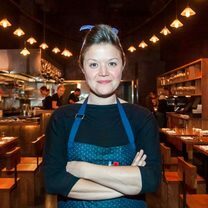 It produces wonderful textures and flavors." "Chef Scott found a winning combination with the king trumpet mushroom dish. The earthiness and meatiness of the mushroom pairs so well with the sweetness of his onion jam. The salsify purée on the bottom rounds it out with the right amount of richness. As a chef who prepares sushi, Sushi Ran is a restaurant I dine at to have an omakase experience (Taka-san is an exceptional Sushi Chef). That being said, I always order this dish when I visit." "By now it almost goes without saying, but this is one of the more popular dishes in San Francisco. I consider it the "asian chicken noodle soup." The best way to eat it takes work but it guarantees an umami bomb with each bite: marinate your jalapeños in fish sauce first, then place some in your soup spoon, add some noodles, scoop up some of the broth and finally add a dollop of Sriracha on top to get a touch of sweetness. That right there is a perfect bite." "This dish is a form of gluttony that I have no reservations about diving into! The combination of textures and flavors is like nothing else I've tried in San Francisco. The first two times I went here, I was fortunate enough to enjoy chef Evan's tasting menu. On both occasions the porcini donuts came out with the appetizers and were so good that I had to order them again after dinner and dessert. So it was the dessert to my desserts. You cannot afford to miss this." "I grew up eating these sandwiches with my dad. For the most part, only true Bay Area natives know about this tiny sandwich shop. They have this amazing garlic spread that they put on each sandwich. Keep gum and/or breath mints ready for afterwards."